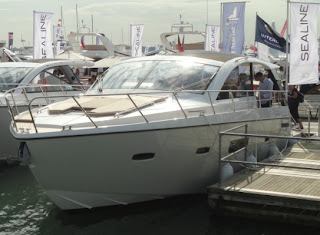 Thanks to one of the friends at the YBW forum we can show you Sealine much anticipated SC42, presented for the first time at the Southampton 2011 boat show. This new Sealine SC42 sport cruiser shares hull with the much talked about F42 flybridge model launched a year at the same show. But apart the hull, this model features a different upper structure which offers a clever design of the aft cockpit deck, one of its most innovative areas, and also a diverse but still very spacious cabin lower plan. The distinct feature of the main deck is surely its wide body usage of the stern, which makes the aft part feel like that to a big walk around boat. This area features two L-shaped settees, plus another L-shaped lounger to port side forward. Helm station is located to starboard side. Another distinct feature is a very extended hard top which brings a lot of thinking in my opinion to the British user, or that of more Northern hemisphere climates. Below is for a two cabins layout, master stateroom to fore with private en-suite head and separate shower room, three berth guest cabin aft with en-suite shower head, C-shaped settee, and galley. The SC42 also features the option for an extended up and down moving bathing platform which increases length by over one meter. 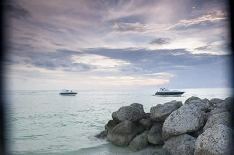 Power is from twin Volvo 330 or optional 370hp with stern drive or IPS pods propulsion. Fairline presented a new cabin layout option for the award-winning 65 Squadron motor yacht at the PSP Southampton Boat Show 2011. The existing 65 Squadron with three cabins plus crew will now be available in an optional four cabin layout with aft crew cabin, giving the choice of accommodation for up to eight guests plus two crew members. The latest cabin layout arrangement enables customers to select a fourth cabin, located port side and featuring opening portholes, full-length bunk berths complete with bedding and a hanging wardrobe. Alternatively, in its three-cabin layout arrangement, the space is fitted out as a day head and utility room. In the master stateroom, the double bed has been newly positioned fore/aft, further maximising the available space. New panoramic hull windows allow light to fill the lower accommodation living areas. Light-filled accommodation has become a hallmark of the range and, in line with the latest Fairline models, the optional aft crew cabin features full transom glazing. An exceptional feeling of spaciousness continues to be provided by the single-level saloon, galley and dinette arrangement, providing sophisticated living areas to relax and entertain. The large cockpit area on this latest model will now include a fixed-height table as standard. 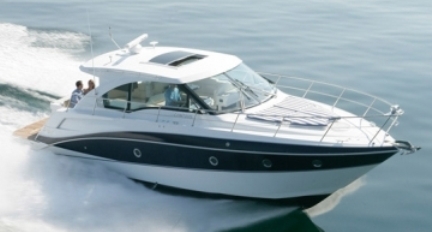 The Fairline 65 Squadron was launched in 2009 and has received much media praise and accolade, including a 'Motor Boat of the Year' Award 2010 in the Flybridges over 55ft category, as judged by a panel of boat testers from UK marine titles Motor Boats Monthly and Motor Boat and Yachting. Grand Banks presents the project of its new flagship the 76 Aleutian RP. This new model increases Grand Banks size by four feet and is set to be the largest and most luxurious yacht in the company's growing lineup. The 76RP features a proven Tom Fexas hull design and timeless exterior styling shared by other yachts in the raised-pilothouse contemporary looking Aleutian Series. But this newest model also introduces a brand new interior design that is more contemporary and European in flavor than any of its predecessors. The graceful flow and simple, clean proportions of this design is well matched to the understated nautical style that has defined the Aleutian Series. It extends throughout a new interior layout that includes four generous staterooms and a much larger salon made possible by the longer, expansive deck house of the 76RP. For exploration, entertainment and enjoyment, the new 76 Aleutian RP is a compelling new choice in many respects. The large flybridge, generous foredeck, and spacious aft deck and dining area all serve to expand envelope for outdoor living. Notably, the vessel's range lets owners stretch their voyage to 1000 nm, or they can speed to the next port at over 30 knots with the largest of the engine options which start from twin 836hp up to 1723 by Cat or MTU. ﻿Maritimo presents the new A53 Aegean Flybridge, a replacement to the A50. The new Maritimo A53 will feature an enclosed bridge as standard, which with the helm station up top, leaves more room to move on the main deck. Big view windows and an astern galley characterize this model, which uses the same hull as the new C53 Sports Cabriolet. Down below the A53 Aegean Flybridge sleeps from five to six in a three cabins layout. Two shower heads serve the guests with the owners room located to port side midships. Another unique or hard to find feature for a flybridge yacht is the tender garage located to aft, with a space for rib of up to 3.2 meters in size. Power is from twin Volvo 670hp which give a comfortable cruise speed of 25 knots. Atlantis continues its We are Open direction, with the presentation of the 38 project. This model is set to be presented in a week's time in Genoa and follows the design direction as started by NeoDesign from designers Salvetti and Biaggi in September 2010 with the 48, followed with the 44 a month later, and continued with the just presented in Cannes new flagship 58. The 38 is set to replace both the 35 Plus, and 40 models. As is with the new Atlantis since 2007, the 38 also follows a very open pattern of the main deck, set for those clients who like to live the sea mostly in an airy fresh environment. So while the 38 features a hard top, which makes easier use in Winter weather, the main deck is all about being open, free, and usable as much possible. The layout here offers a C-shaped settee, chaise lounge pad to port side, with helm and wet bar to starboard. Down below we have a two cabins layout, an L-shaped saloon which can convert to an extra twin berth, galley, and head with a door separate shower stall. Impressive is the layout of the guest cabin located to midships which offers a very spacious double berth, and a nice relaxing sofa opposite. 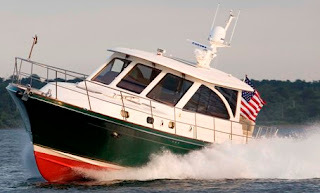 Power is from twin Volvo stern drive with standard being 260hp or optional 300. 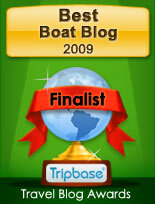 Presenting the project in the fall of 2009, Princess launched the much anticipated V72 in the middle of this year. An important new model from Princess which replaces the V70, and continues the evolution of the V series sports line born in 1993. The V72 apart following the latest design trends of the British builder, also follows the evolution in construction standards being built with the infused resin technique. This now soon to be fully operational on all the Princess models, and being thus far the only British builder to infuse all its boats hull and deck. The V72 follows the pattern of modern sport yachts with a living and entertainment located on the main deck, and joing with the exterior areas of the yacht. Down below is reserved for the three guest cabins, all having a private head, and this area also hosting a spacious galley located in between the cabins. The owners state room is a full beam offer located to midships and has its queen sized berth looking to aft. It also features a beauty desk to port side, and relaxing sofa to starboard. A crew cabin for two is located to aft. Power is from twin Cat or MTU engines from 1622 up to 1723hp. 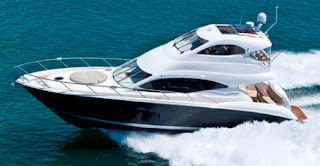 With the large Cat choice of 1723hp top speed peaks are of 37 knots. Sasga is a new company from the Spanish Balearic island of Menorca, founded by Sestri and Gardes, founders of the famous Menorquin which they sold in 2007. The first project model of the new company is the Sasga 12, here continuing the Llaut Menorcan fishing boat philosophy design, but this time featuring more cutting edge modern looks especially to what regards the super structure. A free aft deck, walk around no step side decks, and a living inside with saloon is the main characteristics for this semi displacement traditional cruiser. Down below is reserved for two spacious cabins, and a galley located by the stair case which leads to the main deck. Two heads serve the cabins, with the port side being dedicated only to the forward located owners room. Power is from standard twin 260 up to 315hp, with speeds reaching a max of 21 knots, and cruise being at 18 knots or an economic 12. 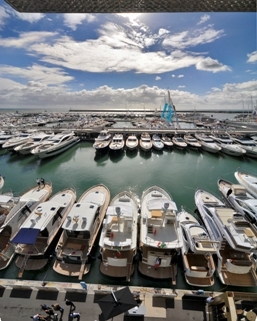 The 51st edition of Genoa International Boat Show, continues its long standing tradition which will be held at Fiera di Genova from 1 to 9 October 2011. Genoa Boat Show will once more be the showcase for the top Italian and international boating industry operators and products, and will be characterised by a perfect blend of design, innovation and craftsmanship. Thanks to its unrivalled product range from the smallest boats to mega-yachts, from accessories to engines, all the way to technical apparel the Genoa Show is the reference event for the boating industry at a global level and for all pleasure boaters: a successful combination of business and training opportunities, sea culture, sports and entertainment. Monday 3 and Tuesday 4 October will be the preferential days devoted to B2B meetings at Tech Trade, the large section devoted to pleasure boating components and accessories. As usual Genoa will be the jump start for some of the latest models; Galeon 400 Fly, Apreamare 56 Maestro S, Arcadia 115, Azimut 60 Flybridge and 62S Italia, Patrone 30 Special, Colombo 39 Alldays, Sarnico 46 Spider GTS, Carnevali 142, Fiart 33 Sea Walker, Giorgi 45 HT, Riva 63 Virtus, San Lorenzo SL94, Sessa 27 Key Largo Inboard and 34 Key Largo Inboard, Uniesse 62 HT, and Wayachts 40 Wake. Itama presents the project for the 62, a model which will replace and is a further evolution of both the FiftyFive and Sixty. Designed by Marco Casali the 62 rendering shows a following to the changes found in the new 45. That is a light slanting stern aft, and new big view windows on the hull side, serving the cabins, lower saloon, and galley. The interior should remain the same or similar, although Itama is stating a light modification to the three cabins, and to the shower heads, this increasing more space. The exterior of the 62 keeps its function as a luxury saloon in the open air dedicated to the maximum living and full contact with the sea. Power to this twenty degrees deep Vee hull sport yacht will be for twin MAN 1100hp standard, or optional 1360 engines. Speeds are for a max of 40 knots with the optional large choice. Overmarine Group announces the project for a new Mangusta 110. 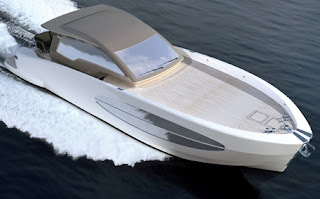 This will be a brand new yacht, and does not replace the famous 108 that remains in the range. Mangusta 108 is an icon of the Italian, Viareggio status symbol brand with her timeless classic design that has conquered numerous customers and still does. Overmarine Mangusta 110, offers a new social area on a sports flybridge deck in addition to the already extended area on the bow that represents one of the main characteristics. Also the new interior layout allows a better space distribution designed for the owner, guests and crew. Standard layout offers four double cabins, with an owners stateroom to midships. Entertainment living area is all on the main deck, with a very large galley located below adjacent to the crew cabins at midships, this also having a small lobby and relaxing zone. The crew quarter is equipped with all the comforts and technical features which has no equals on yachts of the same size. Mangusta 110, for her versatility, has not only been conceived for the Mediterranean Sea but also developed for other markets. The design department of Overmarine Group, offers several style proposals, and as is the usual philosphy is also ready to work and to do semi custom designs with the most demanding owners. Power is from twin MTU 2600hp with jet drive propulsion which give a top speed of 33 knots. 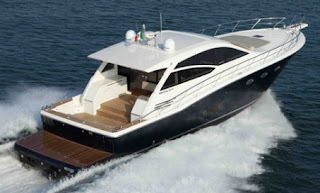 Uniesse launches the much expected model the 62 HT, following what was seen with the current flagship of the Italian builder the 75 HT launched in 2007. The 62 HT will also sit in between the 57 Open, and the flagship model to what concerns this range. The HT range takes the classic US hull lines of the of the Open series with an enclosed more modern super structure which makes all year round usage very easy. But the free aft deck, the shear line, and the mezzanine L-shape settee tribute the US sportfish boat. The 62 HT follows what many Sport Yachts of this size offer with a living on the main deck, C-shaped sofa, entertainment cabinet, but is distinctive for having a galley located below. Down below is for three spacious cabins, with an owners stateroom located to midships, and an impressively sized VIP suite to fore with its queen sized berth resting on to port side. Power is from twin MAN standard 1000hp or optional 1200hp engines. Standard power give 34 knots of max, while the optional choice adds top speed by three knots. John Deere Power Systems is pleased to announce a new 550hp recreational vessel rating for the 6090SFM75 marine engine. 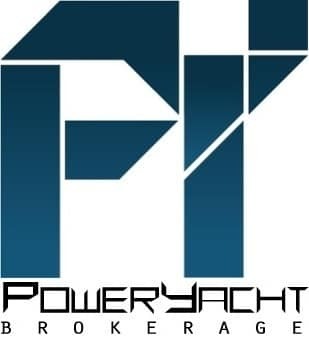 The PowerTech 6090SFM75 recreational rating joins the 6068SFM75 298 400hp and 6135SFM75 750hp recreational ratings to offer customers a complete lineup of John Deere marine engines that are rated for high-speed recreational craft such as sport fishing boats and planing hull yachts. 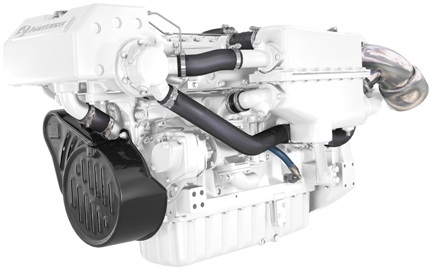 This new John Deere marine engine rating is due to hit the water in November 2011 as an addition to the current 6090SFM75 325 up to 500hp power options. This new engine rating meets EPA Tier 2 and EU emissions requirements and is MARPOL Annex VI compliant. The PowerTech 6090SFM75 has 9.0L of displacement with a six cylinder, electronically controlled, turbocharged and air-to-seawater after cooled marine engine. Jet Tern presents a new line to the Selene Ocean Trawlers range with the 58 Ocean Express range. This new line started as customer requests and sees Jet Tern integrate a more modern US line to the range. The Selene 58 Ocean Express was born as a 53 project and was built for a Hong Kong client. 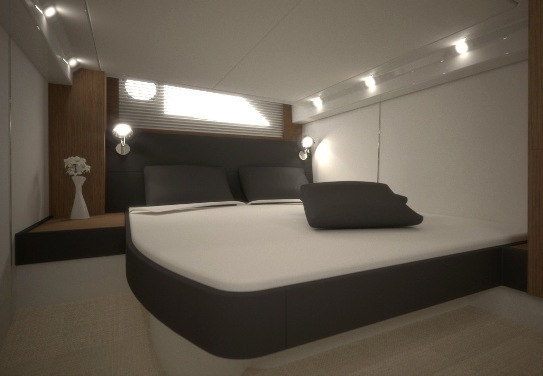 The accommodation layout of the Selene 58 Ocean Express features a forward master stateroom with en suite head, closet, and storage along the sides. 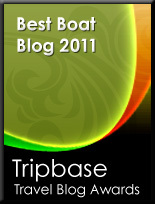 A guest stateroom is to port and a second full head is to starboard. The saloon and galley space are open arrangements with large windows surrounding so that those on board can comfortably entertain and enjoy the surroundings. A raised pilothouse also includes a settee to port for guests and the helm station is centered in front of large forward windows. Twin Cummins 405hp engines will power the 58 Ocean Express, which unlike the other standard Selene features a semi displacement hull to a top speed of 21 knots. Italian builder Raffaelli who just received new investment presents its latest challenge and new direction to the market with a project for a 55 Storm IPS. This model is a fully enclosed sport yacht, sun roof hard top and aft patio door, and as the title says is to be powered by the Volvo forward looking dual propeller pods. The design is trusted to Italian naval architect and designer Milavonovic, who presents lines which pay homage to this builder forty years plus story in boat building. So far Raffaelli has not advised if the 55 Storm is to replace the 2003 presented 57 Kubang. As the enclosed configuration usually shows, the 55 Storm offers a living on the main deck, with intelligent modern solutions making part of the concept as astern galley by the patio door which also serves the aft cockpit, and a wet bar to port side. A C-shaped dinette is to be found to fore of the interior saloon to port side, with a very forward located helm station to starboard. Down below we have an area dedicated only to the cabins, here offering three spacious rooms, with each having its own en-suite bathroom. The layout while making the best of IPS pods, impresses not only for having a cabin with no bunks but also for the space dedicated in each room, and for the spacious owners stateroom located to midships. Standard power for the 55 Storm IPS is from twin Volvo 435hp with the builder promising a top speed of 31 knots at a full load of 18 tons. Galeon invites its clients, friends, and boat lovers to the 51st Genoa International Boat Show 2011, from the 1st to the 9th October. The Italian boat show is considered among the largest shows on the planet, and Galeon will be located on stand E51 where it will present the following models; 325 HTS, 385 HTS, 640 Fly, 780 Crystal, and the World Premiere of the much anticipated 400 Fly model. At Genoa, Galeon will also show a selection of the entry level Galia brand; 475 Open, 520 Open, 630 Open, 630 Sundeck, 650 Hardtop, and 700 Sundeck. 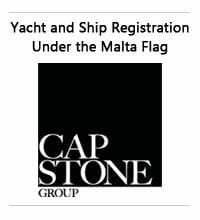 The 2011 International Cannes Boat Show proved to be very successful to Galeon. Five models including the much accepted World Premiere of the 780 Crystal, were showcased on two separate stands which continuously gathered the crowds attention. The close proximity to other World famous brands allowed the visitors to compare between the models, and just how much Galeon has pushed forward its quality and the standard of its cruisers and yachts from 26 to 78 feet over the last years. Koot Yachts from Tunisia presents its first model the 54, which was officially presented at the recent Cannes Boat Show 2011. Loft on the Sea is the design philosophy that inspired the yard to create this 16 metres open characterized by wide open spaces outside and inside, providing a continuous contact with the sea. The Koot 54 is built in Tunisia by a working team headed by Italian architect Francesco Maria Giulini. The exterior design is by Koot Design Team, with interiors designed by the architect Giulini and the hull designed by renowned naval architect Sergio Cutolo. Over sixteen meters long this is a sport yacht that offers unique seamlessly environments: no internal cabins but one large lounge area directly connected to the cockpit, creating a unique space between the interior of the boat, outdoor areas and the sea. Large spaces also characterize the outdoor area: the stern is completely open to the sea and only three steps separate the cockpit from the spacious bathing platform as well as an area at the bow completely covered with teak becomes a very large and comfortable sundeck . The Koot 54 has a planning hull with V-variable angle and is fitted with two MAN R6 800hp diesel engines which deliver a max of 36 knots and a cruise of 32. Hunt 52 Express Cruiser hull number 6, arrived to be the first IPS propulsion with Joystick Control. Not only does her performance exceed all expectation in ride, speed and fuel efficiency, but the layout is just perfect for those families who frequently cruise as two persons, yet occasionally might need to accommodate more couples or children and friends. That is because the Hunt 52 Express with Volvo forward looking dual propellers pods drives can easily be designed with a three staterooms layout. The spacious salon can be arranged as a living room suite with two barrel chairs, settee and convertible dinette table. The performance numbers are impressive and the IPS version also features smaller fuel capacity of 2270 liters, that is 290 liters less to the standard Cats 710hp shaft engined model, and 570 liters minus of the Cats 1001hp choice. Yet with this less capacity it still delivers a range of 300 nautical miles at cruise speed. Same as the Cats 710hp yet with less fuel. Top speed with the 690hp IPS900 is a 30 knots max, and a 25 of cruise.